The text from the recently published FrankenFly blog post comes from the introduction page of a salmon fly portfolio book I created in Apple's iPhoto program. I decided to bring the book to tying shows and presentations so I wouldn't clutter up my table with a bunch of flies (except for what I was tying at the time). Besides flies, there are plenty of fishing images and scenery shots from various salmon rivers. I'm very happy with how it turned out and it will be easy to add pages and print another, should I decide to do so. A few people have asked about purchasing the book. For its size, it costs too much to print to justify the price I would have to charge to recoup what I spent, so I'll just be using it as a personal portfolio for the time being. 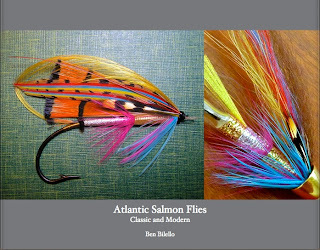 Toward the end of the twentieth century, we began to see a disconnect between the art of Atlantic salmon fly tying and the sport of Atlantic salmon fishing. In the right hands, a workhorse fly pattern like the Jock Scott became a large, immaculately crafted object, suitable for framing and hanging on one’s wall. Though many like it have hooked thousands of salmon over the last century and a half, this particular fly will never see water, much less the business end of a dime bright Atlantic salmon. Creative fly tyers soon pushed past the boundaries of the old “recipe books” and designed vanguard works of art in a previously underutilized medium. Meanwhile, equally imaginative salmon fishermen used elements of classic salmon fly design as templates for bold new fish-catching patterns. The iconic mixed wing of the classic salmon fly took shape in more mobile forms. Lustrous exotic feathers were replaced by synthetic materials, which have a glow even more powerful than their predecessors. In some countries, large hooks were replaced with plastic and metal tubes. Armed with small double or treble hooks, these tube flies have become a more efficient fish fighting tool. 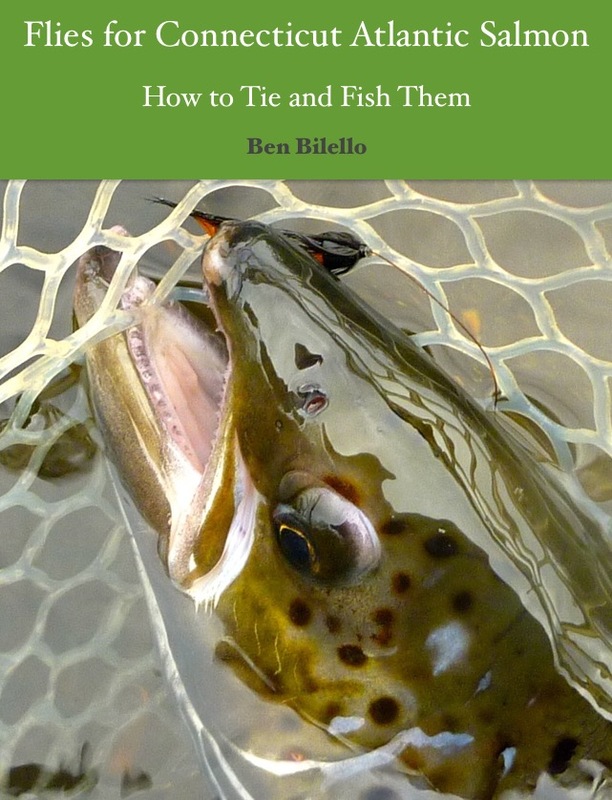 Outside influences, such as trout and saltwater fishing and fly tying techniques, made their presence known to the salmon fishing community. As a professional musician friend of mine passionately states, “Innovation does not exist in a vacuum.” As in jazz music, fly tying innovation does not exist in a vacuum. The well-worn patterns and techniques of great fly tyers past are constantly tweaked to make more effective salmon-catching implements. Though modern materials may replace rare feathers and delicate silks, the classic flies of the Victorian era live on in new forms. Salmon fishers and fly tyers from North America, the United Kingdom, Scandinavia, Russia and Iceland all have something unique to offer. Embracing this diversity and learning from one another will help take the sport of salmon fishing, as well as the art of salmon fly tying, to the next level. 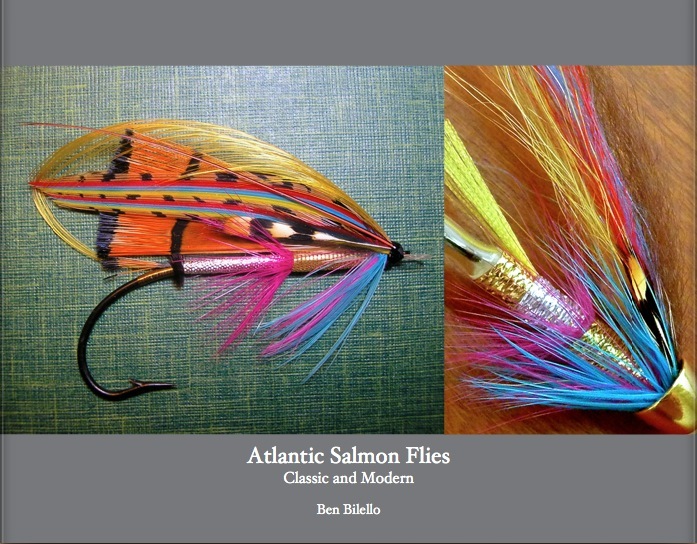 I began tying classic Atlantic salmon flies shortly after my first salmon fishing trip in autumn 2007. Tying the classics was a way to “stay connected” to the sport when I was unable to participate in it. Though the history of Atlantic salmon flies and fishing initially drew me in, it is the evolution of the sport that truly excites me. Whether I tie a classic salmon fly, a Scandinavian-style tube fly or an original piece of “feather art,” I try to remain aware of the complete breadth of the sport of Atlantic salmon fishing, as opposed to smaller parts of it. Great job on the portfolio book Ben! That looks very professional. Nice work--I'll have to look into that program. Lovely to look at and read. Well done sir.